Airlines in southeast Asia are striving for a return to mediocrity. Tragedy and political upheaval provide a chance for Malaysia Airlines and Thai Airways to restructure deeper than before. The state shareholders of the two similarly sized loss-making national carriers are backing reform after crisis hit. Yet the problem is widespread. Even when in good shape, running an airline in an oversupplied region is a tough business. Malaysia Airlines was already battling falling ticket sales after one of its flights en route to Beijing disappeared without a trace five months ago. The missile that brought down MH-17 in Ukraine on July 17 may push its finances over the brink. The airline will almost certainly need a capital injection by 2015. Thai Airways, meanwhile, saw its passenger numbers slump 31 percent year on year in June after the military took power in the country. It is highly leveraged too, with net debt to reach 9.5 times its EBITDA in 2014, according to Eikon estimates. Airlines in the region already face intense competition, especially from low cost carriers like AirAsia, which as a group have almost 60 percent market share by capacity. Southeast Asia is the only part of the world where airlines have more planes on order than in their fleet, according to the Centre for Asia Pacific Aviation. Nearby Middle Eastern carriers backed by rich governments are expanding rapidly too. At the same time, oil prices have kept costs high. Restructuring could take many forms: delisting, asset sales, and equity partnerships with rival airlines are all options. But a turnaround will also require cutting the bloated workforce. Despite multiple efforts to reform in recent years, Malaysia Airlines has failed to significantly reduce headcount. The new head of Thai Airways, an air chief marshal with little experience of running a company, plans to boost revenues and reduce costs but also says job cuts are not currently planned. Having government shareholders doesn’t rule out profitability. Singapore Airlines, 55 percent owned by state-fund Temasek, is cash rich thanks to a management with a close eye on costs. The state has actually helped to rein in the country’s unions. Yet forecasts compiled by Eikon point to it making a 1.7 percent operating profit margin in 2014. That doesn’t leave much hope for the less fortunate. Malaysia Airlines’ controlling government shareholder may announce a plan to buy the rest of the national carrier as soon as August, according to the Wall Street Journal. 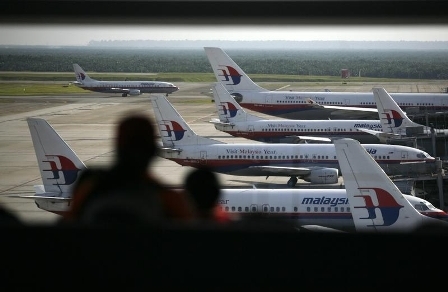 Khazanah Nasional, which owns 69.4 percent of the operating company called Malaysian Airline System, was already planning to announce a restructuring within the year. On July 17, Malaysia Airlines flight MH-17 crashed in Ukraine killing all 298 people on board after being hit by a missile. In March, Malaysia Airlines flight MH370 disappeared en route to Beijing. That plane has yet to be found. Separately, the board of Thai Airways will consider a restructuring plan at a meeting on July 24. The company, 51 percent owned by the ministry of finance, is the first being targeted for reform by the country’s new military rulers. The loss-making airline will aim to boost revenue by 3 billion baht ($94 million) and reduce operating costs by 4 billion baht, Thailand’s Air Chief Marshal Prajin Juntong said on July 18. Job cuts are not currently being planned, he added. The airline aims to return to profit in the second quarter of 2015. “We need to get rid of the excess fat for restructuring,” Prajin said. Five board members have resigned since Thailand’s military junta came to power. Four of those had links to former Prime Minister Thaksin Shinawatra, a source at the airline told Reuters.